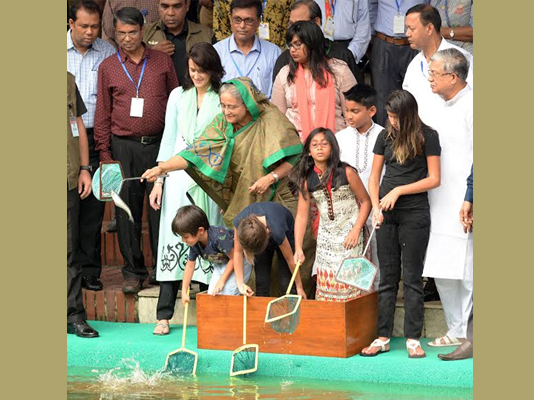 Prime Minister Sheikh Hasina on Monday released fish fingerlings into the lake of her official residence Ganabhaban this noon on the occasion of National Fisheries Week-2018. Fisheries and Livestock Minister Narayon Chandra Chanda, Prime Minister’s Principal Secretary Md Nojibur Rahman and secretaries concerned were present. The National Fisheries Week was observed across the country this year from July 18 to July 25 to create awareness among the people to produce more fish through proper use of water-bodies and protect indigenous fish species from extinction.